It’s been really cold here in NYC like around minus 10 degrees and really windy. When I was listening to the weather forcast this morning, the newscaster said it was bone chilling cold. Bone chilling cold! 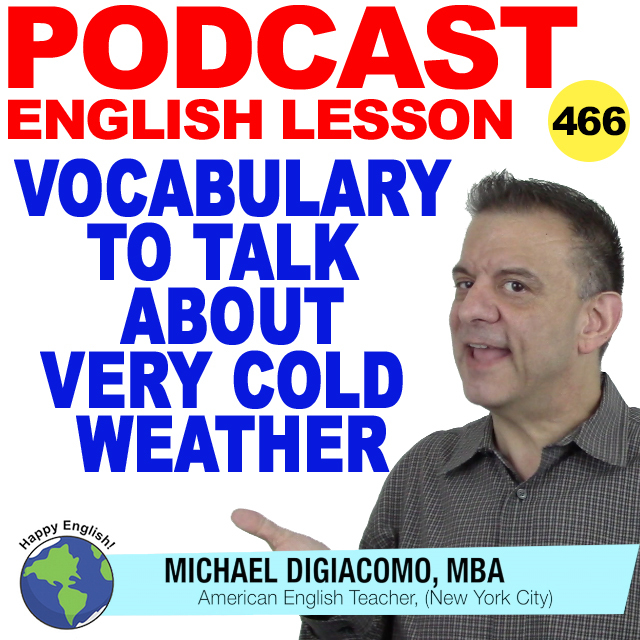 That phrase not only made me realize how cold it is outside, but it gave me the idea that we have a lot of vocabulary related to the cold weather. So, for today’s English lesson, let’s check out 13 words and phrase that you can use to talk about very cold weather. It’s been frigid outside for a week. It’s pretty frigid in New York these days. It’s been biting cold outside for a week. It’s pretty bone chilling cold in New York these days. It’s freezing outside. I think we should stay home. It’s really freezing in this room. Let’s turn on the heater. I’m freezing. Let’s go into that coffee shop and have something warm. This is the second cold snap we’ve had this winter. It looks like we are going to have another cold snap next week. It’s cold and blustery outside. We are having another blustery day today. It seems like we’ll have low temperatures and gusty winds tonight. The forecast said we’re going to have gusty winds all day. It took me fifteen minutes to scrape the frost from my car windows this morning. The frost on the windows in the living room looks so pretty! I hear some skiers got frostbite in the mountains. You really need dress warmly to prevent frostbite. In New York City, we usually have one blizzard every winter. I don’t want to drive in a blizzard because it’s too dangerous. You have to bundle up when you go out on a cold day. We should bundle up before going outside. The temperature is 32 degrees, but the wind chill factor is about 15 degrees. The wind chills are in the single digits today! I heard they had sub-zero temperatures in Chicago this week. When we have sub-zero temperatures, I try to stay in the house!